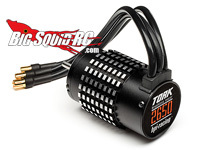 HPI FLUX TORK 2650Kv BRUSHLESS MOTOR « Big Squid RC – RC Car and Truck News, Reviews, Videos, and More! HPI has come out with a super charged brushless motor for their Savage Flux truck. Get more RPM and more top speed with the Flux Tork 2650. The Flux Tork 2650 features massive machined cooling fins to help keep it cool when you’re driving all-out. With a 5mm motor shaft it can fit the upcoming optional pinion gears so you can get even more top speed for those insane runs, or gear it down a bit for increased acceleration on the track.